Find out what business capabilities are and the steps to achieve a business capability model that fits into your enterprise architecture. Read 3 case studies showing the value of business capability modeling for enterprise architects. In the digital age the role of technology shifts from supporting processes of the business strategy to the key factory of strategy execution itself. Information Technology helps that customers receive their shirt ordered online the next day, it helps that they can read their newspaper during their commute on an iPad and that the invoices for these services are processed without friction. As a result, the challenge how to bridge the gap between strategy and execution in IT becomes much more pressing. This gap is often caused by organizations speaking many languages. They speak of missions, strategies, goals, processes and projects. The CEO speaks of “making mobile first a priority”, Marketing of “increasing the share of wallet with millennials” and IT of “load balancing the Linux server cluster”. Which one is the right language? 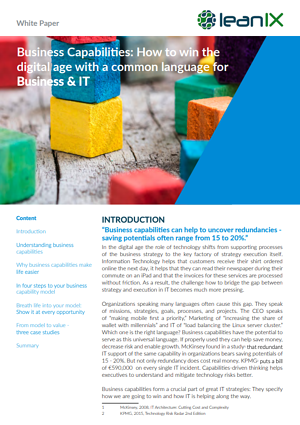 Business capabilities have the potential to serve as this common language. This whitepaper helps to understand what Business Capabilities are, it explains why it makes your life easier and it gives a practical guidance how to develop an own business capability model in four main steps.